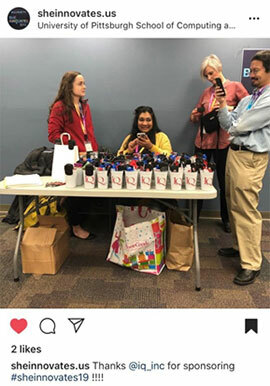 We can all agree that we need more women in tech, which is why IQ jumped at the chance to sponsor Pitt’s ‘She Innovates’ hackathon last Friday. Any local students could enter the competition, so the ranks included not only Pitt students, but also teams hailing from CMU. Several IQ-folk attended to support these young women on their hackathon journey. The event kicked off Friday evening with some time getting to know the young competitors. Many of the students were particularly inspired by the chance to improve quality of life through software and were passionate about female empowerment. Some even indicated interest in industries ranging from Medical Devices to Computational Linguistics and Cyber Security. After the initial meet and greet, Steve Hayashi mentored some of the competitors, and even worked closely with the group who won the hackathon. In a former life, Steve (to the far right of the first image) mentored graduate students. He enjoys sharing information to those eager and willing to learn. Saturday, a team of IQ Software Engineers volunteered to share insight into how candidates can find the best company for them. 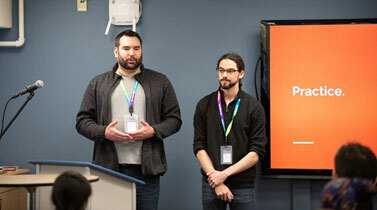 Andrew Eagle and Brenton Niebauer put together a presentation on exactly how to do this. From what to research to preparing for the technical question, the two shared a wealth of information that is not only helpful for STEM students, but also any job seeker. To close out the weekend, our CEO, Barbara VanKirk, acted as one of seven judges for the competition. There were 25 presentations, and the judges chose the top three performing teams. Teams were selected based on Technical Difficulty, Originality, Progress, and User Experience. Follow us on LinkedIn and Instagram for more updates.